With $2 beers and a kiddie pool, this is a party you won't want to miss. There’s the right multimedia festival for every city and every generation. Miami’s youth are about carefree fun with a sense of humor and a decent amount of good taste. 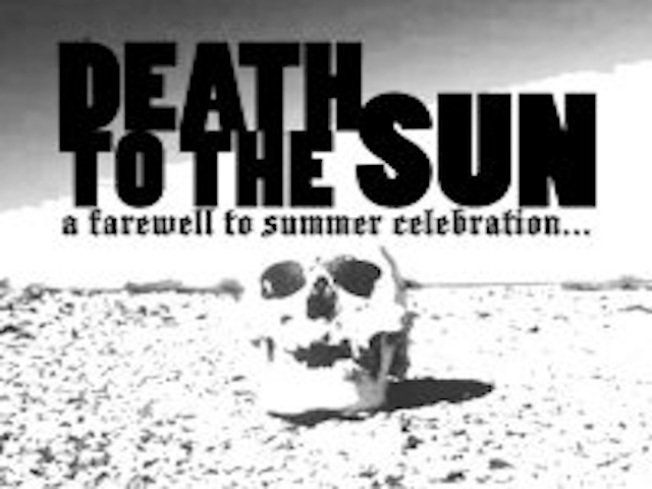 Perhaps Death to the Sun will meet all of the needs of this demographic, an all day, all night affair saluting the end of summer. Granted, Miami summers last until November, but the intent is truly noble and Wiccan friendly. The party lasts from one to one and admission and parking are free. Drinks are dirt cheap since it’s taking place at the American Legion. Two dollar drafts alongside sprinklers and a slip ‘n’ slide tend to equate to a wild time, so come ready to get wet and bring a towel. The lineup includes seventeen acts, including Curious Hair, Weird Aleister Crowley, This Heart Electric, Electric Bunnies, Dino Felipe and a special appearance by Otto Von Schirach’s Voodoo Witch Doctor. Basically, there’ll be a ton of craziness to gaze upon and tons of stuff to do, that in retrospect, you probably shouldn’t have been doing. Sounds about right for a Saturday afternoon on the bay. The awesome name of collector and seller of vintage tees, sneakers and records is only half the appeal of Ohh Shirt. His supply of t-shirts are rife with great bands and humorous sayings, you’ll feel a deep longing to own what he’s got. Ohh Shirt will be selling his wares at Death to the Sun, so you’ll have to find somewhere to hide your wallet in your Speedo. Apparently flexible types from the Florida Circus Arts School will be horsing around, there will be fashion and silkscreening available for purchase. Video work and visual projections will be provided by Chris Video and Aiden Dillard director of Death Print. DJs include Alex Caso, DJ Healer, DJ Nuit, R3K + Romulo Del Nutsack and Treasures. Read more of Liz Tracy's Miami missives on her blog, Miami, bro.